Shana Alexander (October 6, 1925 – June 23, 2005) was an American journalist. 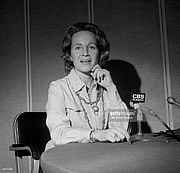 Although she became the first woman staff writer and columnist for Life magazine, she was best known for her participation in the "Point-Counterpoint" debate segments of 60 Minutes with conservative James J. Kilpatrick. She was a daughter of Tin Pan Alley composer Milton Ager and his wife, columnist Cecelia Ager. Alexander graduated from Vassar College in 1945, majoring in anthropology. She fell into writing when she took a summer job as a copy clerk at the New York newspaper PM, where her mother worked. She worked as a freelance writer for Junior Bazaar and Mademoiselle magazines before becoming a researcher at Life for $65 a week in 1951. During the 1960s she wrote "The Feminine Eye" column for Life. In 1962 she wrote an article for Life Magazine entitled “They Decide Who Lives, Who Dies: Medical miracle puts moral burden on small committee,”  which sparked a national debate on the allocation of scarce dialysis machine resources. Another Life magazine article, about a suicide hot line worker's efforts to keep a caller from killing herself, was turned into the 1965 film, The Slender Thread, which starred Sidney Poitier and Anne Bancroft. She also wrote a number of nonfiction books, including Anyone's Daughter, a biography of kidnapped heiress Patricia Hearst. Her book Nutcracker, about Frances Schreuder, the convicted socialite who persuaded her son to kill her millionaire father, was made into a 1987 TV miniseries. Schreuder was played by actress Lee Remick. Shana Alexander died of cancer in Hermosa Beach, California, aged 79, on June 23, 2005. Shana Alexander is currently considered a "single author." If one or more works are by a distinct, homonymous authors, go ahead and split the author. Shana Alexander is composed of 2 names. You can examine and separate out names.